Here’s a disclaimer: These pictures are from over a week ago, back when a few leaves still clung to the trees and I was considering late season bulb sales and a final mowing of the lawn. Things have changed though, and this morning the temperature sits at 16F (-9C) and a dusting of snow is frosting the green and uncut grass. Don’t get me wrong, there’s still an extremely strong possibility I will breakdown and order more bulbs (and not be able to plant them), what I’m saying is there’s no chance of me going out there and taking more current pictures! So fall grasses it is! Here’s Panicum ‘Dallas Blues’, probably one of the top 5 grasses I grow, and also the panicum responsible for changing my low opinion on these native grasses. These clumps have a cool blue tint all summer, don’t flop, don’t seed, and will now keep this orange tint all winter while the surroundings go tan and grey. They even bounce back up after a snow. ‘Dallas Blues’ convinced me to try a few other panicums. I don’t like them as much, but will definitely keep them since they also have their special traits (and they are a PAIN to dig up). Here’s ‘northwind’, a selection that is unique for its tight upright growth habit. ‘Northwind’ is also a grass that will stay up all winter and is what I would call an architectural grass. It’s form makes a nice accent in the landscape…. maybe not in mine, but I’m sure you can do better! ‘Cloud Nine’ is a big panicum, but I do tend to like my big grasses 😉 This young plant made it up to 7 feet and was a nice explosion of flower heads this fall (a cloud one might say), but I’m not loving the absolutely dead tan winter color. This combo also might be a little too heavy on the dead tan colors. The Korean feather grass (Calamagrostis brachytricha) to the left looks like it might be dead (I’m hoping it’s not) but the pink muly grass (Muhlenbergia capillaris) still holds a bit of color. I’ve heard of the Korean feather grass reseeding, but I don’t think my own plant has started yet (year 3). The pink muly doesn’t seed at all for me, since this southeast native grass waits so late to bloom. The red color in the last picture is a burning bush (euonymus alata) and its days may be numbered. Even though they show up in many local landscapes they’re very invasive. I haven’t seen any seedlings yet, but don’t doubt they’re out there, so next spring I may move one of the blueberries into its spot. The color is not as intense and the shape is less tight but you get delicious blueberries! ‘Skyracer’ purple moor grass (Molinia caerulea subsp. arundinacea) is a top 5 grass. Up to 6 foot tall seed heads come up out of a neat 2 ft fountain of foliage. It’s tall yet airy and light, and the yellow fall color hangs on for a while. If winter comes late and seeds ripen there might be a seedling or two next spring but hardly anything to worry about. The plant practically falls apart over the winter and is an easy cleanup. Not so easy to clean up is the miscanthus giganteus growing up against the fence. It’s a 6 foot fence so this grass is tall even with the drought. The lower foliage dies off when water is short but I of course like the height. It will be a pain to remove when it’s novelty wears off, considering this is a 3 yr plant from a quart pot….. Miscanthus in general are losing their hold on me. The springtime cleanup is a pain with their tight clumps and I’m starting to think of them as industrial park plants. They look great there, but might be too much work in my own garden. 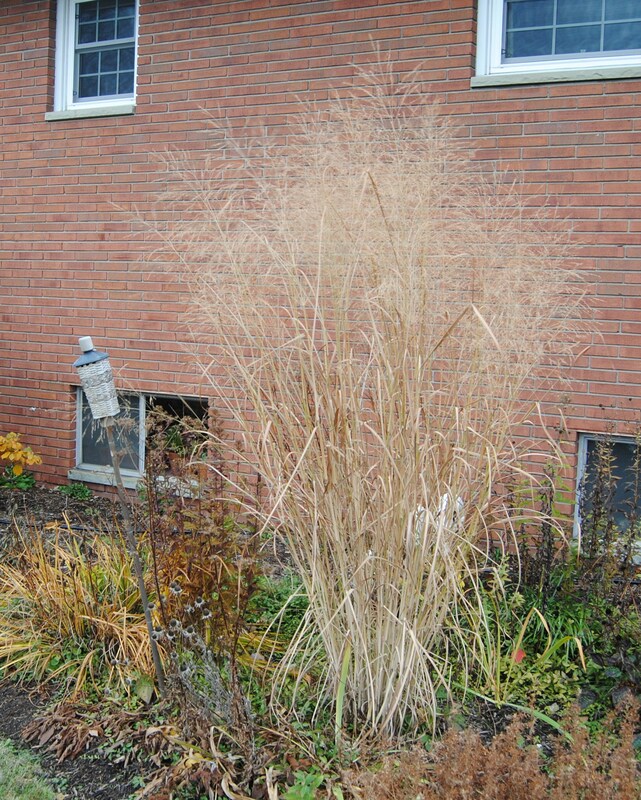 I still have a few variegated kinds and who knows what next year will bring, since my fickle crabby self might divide up this porcupine grass (miscanthus sinensis ‘Strictus’) next spring and plant it all over the place. Planting grasses is easy, it’s removing ornamental grasses that’s the problem. My only advice is sharpen your shovel beforehand, you need a nice blade-sharp tip to make the job almost easy, but even then you really have to put your back into it. Also watch the seeders. I’ve evicted the taller Pennisetum alopecuroides because of their reseeding (the real dwarf ones seem to be sterile) and I’m keeping my eye on the Korean feather grass. Most of the trimmings can be composted, but don’t mulch your daffodil bed with fresh little bluestem mulch, it makes a great grass seedbed and will make you hate your daffodils and weeding them. Grasses that spread by runners are also something to watch out for. Despite all the warnings against planting gardener’s garters or ribbon grass (phalaris arundinacea) I did it anyway. Mine is the supposed-to-be-less-invasive ‘Strawberries & Cream’ but I know that won’t be the case. Just because I do stupid things doesn’t mean you have to, I’m just a sucker for variegated plants. -by the way it’s more of a summer grass so by fall it’s fading fast. This entry was posted in fall, perennials, Uncategorized and tagged best ornamental grasses, best panicum grasses, fall grasses, growning ornamental grasses, miscanthus giganteus, molina skyracer, ornamental grasses, panicum 'dallas blues', panicum cloud nine, panicum northwind, strawberries and cream ribbon grass. Wow, you do have lots of different grasses! I seem to have a love/hate relationship with them, some I love, various Miscanthus and my all time favourite Stipa gigantea, but have dug out so many Stipa tenuissima as it seeds everywhere! I do wish we could grow your pink muly grass, it is gorgeous but not hardy here unfortunately, I suppose I could put it in a pot, but then that would mean one more to be brought in for the winter! I do have quite a few, I really need to work on fitting them into the garden better though! You’ve made me regret not having stipa gigantea… It was supposed to be in the last big grass order but in my haste I clicked on miscanthus gigantea instead and didn’t get the one I really wanted! We’re too far north for stipa tenuissima to overwinter and I didn’t get seedlings so maybe I dodged one bullet there. The pink muly is nice but I’m also just north of a really good show… Kind of like the pampas grass I nurse along each summer only to have it die back so much each winter! 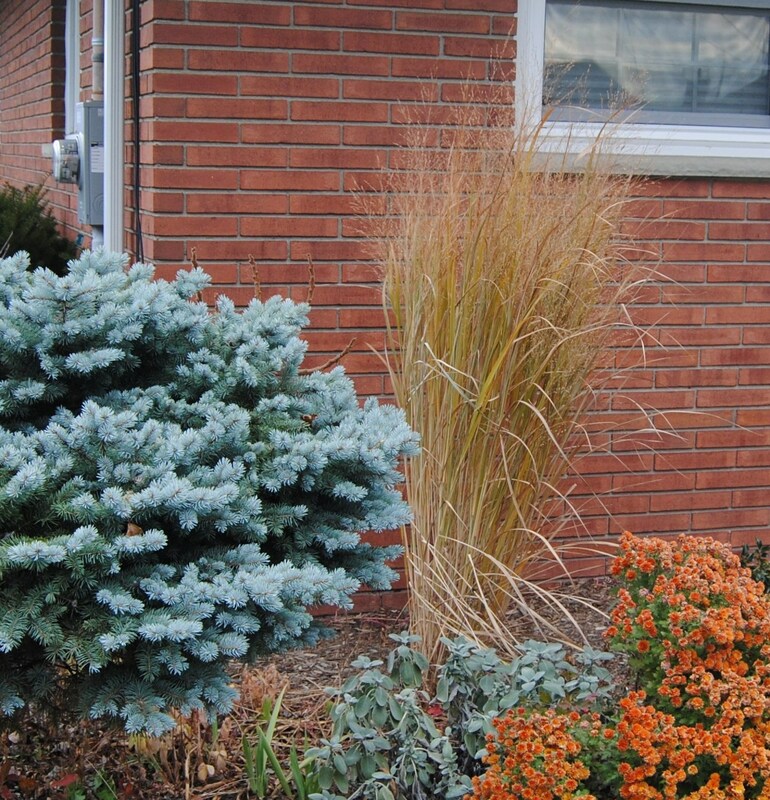 Interesting to see how you use a variety of grasses for winter interest. I have one pink muly grass and I lately have been admiring a large commercial planting of a white version of pink muly that is very attractive. Hope things warm up for you.We’re predicted to reach a low of 20F Monday morning and it will stay cold all week. Haha, it’s the first couple days of cold and I’m already complaining! You’re lucky to be able to grow the muly grass well, the white looks very attractive too…. Stay warm down there, I think you have a better chance of getting a sunny break in the weather than we do. I’m not a big fan of Miscanthus either, and not just because of my nativist tendencies. I just don’t like the look of the seed heads. I’m very tempted by ‘Dallas Blues’, all my Panicum are ‘Northwind’. However, I’ve been thinking about digging out some New England Aster and replacing it with ‘Red October’ Big Bluestem. As far as favorites of mine that you didn’t mention, there’s Little Bluestem ‘Carousel’, also Prairie Dropseed. I’m surprised that Pink Muhly grows for you, I didn’t think it was hardy in zone 5. I guess I’m going to call myself zone 6, since we really don’t go much below zero anymore, but I think the hardiness of muhly grass varies a bit depending on where it’s from. Mine has taken temps down to about -5 so I suppose it’s a hardier strain….. I need to try out a few of the little bluestem cultivars. I have one of the redder ones, but the blue tinted plant didn’t make it for me. For as good as the wild ones do I run into problems with transplants! Maybe it’s time to try again. I love the Panicums too, but I don’t have any in my gardens…too shady. I do have a nice Carex “Oehme’ on the stream side. Grasses have never excited me, maybe because I have always had pretty small gardens. But when I see them used correctly in larger gardens they really shine! The sedges have been safe from me so far. They don’t seem to like the summertime droughts around here and I just can’t seem to make them happy! Hakonechloa is very hardy here! I do have a large clump of it and I wish I could propagate it more quickly. It is so slow from divisions if they take at all. Maybe someone has some advice for me there. I inherited a few grasses when I moved here. I am pretty sure one is a variegated miscanthus, but not sure of the others. I appreciate your recommendations. What zone are you? I was under the impression it was too cold for pink muhly here, but maybe I’m mistaken. I guess I should try. Have you ever seen what Fairegarden does with pink muhly? Fairegarden’s pink muhly plantings are amazing, they make my little plants look borderline abused! I should have thought to put in a link. I don’t know just how hardy the muhly grass is, the problem with it is less hardiness and more so the late bloom time. Just when it’s starting to explode into color a freeze comes along to shut it down, so I just don’t get the full effect. I’ve upgraded myself to zone 6. Even though we’re sitting in the freezer right now we rarely see temperatures go much below zero any more. I might start planting gardenias and camellias soon! I’m such a sucker for almost any plant with variegation. The phalaris is a real good one with those pure white stripes! Good review on your grasses. I had a chuckle at digging them out because the gas company was here digging up my front garden to replace lines and put in an outdoor meter. They had to remove a huge Miscanthus sinensis ‘Zebrinus’ and a very well established ‘Morning Light’. Plus a very embedded Taxus, all by hand digging because of my hardscape. Since they were making a mess, I was glad it literally pained them digging out the plants. It didn’t pain me thinning out a few plants though. In my opinion there really isn’t anything that can replace the euonymus, but it really is invasive in parts of the US. The woodlands near my brothers house are completely filled with it to the exclusion of any other plants. Unfortunately the seedlings don’t color up either because most are in fairly dense shade. I don’t want the same thing here, I much prefer the sumacs, and they do put on an amazing show along the roadsides.